Published in China Outlook, 10 Feb. 2014. 1. 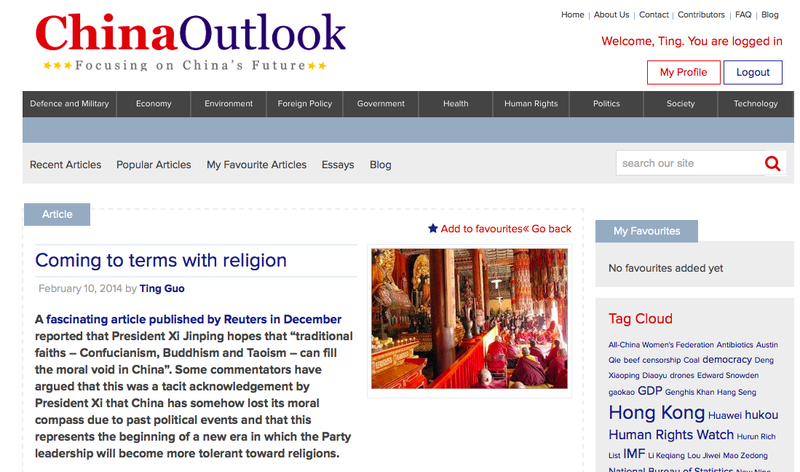 Some commentators have argued that President XI Jinping’s recent speech was a tacit acknowledgement that China has somehow lost its moral compass due to past political events and that this represents the beginning of a new era in which the Party leadership will become more tolerant toward religions. the social reforms initiated by Deng Xiaoping and embodied in the 1978 Constitution guarantee “freedom of religion” in Article 36, which states that “no state organ, public organization or individual may compel citizens to believe in, or not to believe in, any religion; nor may they discriminate against citizens because they do, or do not believe in religion. The state protects normal religious activities… nobody can make use of religion to engage in activities that disrupt social order, impair the health of citizens or interfere with the educational system of the state.” However, religions were not given carte-blanche. Instead, the government established five state-sanctioned religions: Taoism, Buddhism, Islam, Catholicism and Protestantism. The rest remained beyond the pale. 3. As Oxford sinologist Prof. Barend ter Haar points out, folk religions were seen as containing the potential of harming the imperial central regime, therefore religions were feared, their followers cast out and prosecuted. In recent times, Falun Gong can be seen as one example which also shows the framing of a stereotype and the central government’s control over all matters ideological. It has, for example, been widely noticed that Christianity in China, particularly rural China, has been highly localised in terms of the church architecture, the liturgy and many other aspects of worship and religious practice. However it should also be noted that many non-local forces are at work, connecting Chinese Christianity to the wider world of Christian communication. Christianity retains its catholic nature beneath its localised images and diversities in China today, which certainly pronounces issues regarding the “global” and “local” aspects of world religions.